Is the stock market ready for further growth? According to Bloomberg, the Fed stimulus helped in pushing the S&P 500 up as much as 153% from its March 2009 low, as better-than-estimated corporate earnings also fueled equity gains. Of the 483 companies in the S&P 500 that have reported quarterly earnings this period, 71% surpassed profit estimates. On Wednesday, the S&P 500 fell 0.6% to the lowest level since July 8 as minutes from the Federal Reserve’s July meeting showed officials support stimulus cuts this year if the economy improves. In this way, the Standard & Poor’s 500 Index extended its decline to 3.9% since closing at its latest record on August 2. Despite this decline, yesterday, U.S. stocks rose on data showing improvement in global manufacturing and the American labor market. The S&P 500 index gained 0.9% and climbed to 1,656.96. Will they keep rallying? Let's take a closer look at the charts to find out what the current situation in the general stock market is (charts courtesy of http://stockcharts.com). 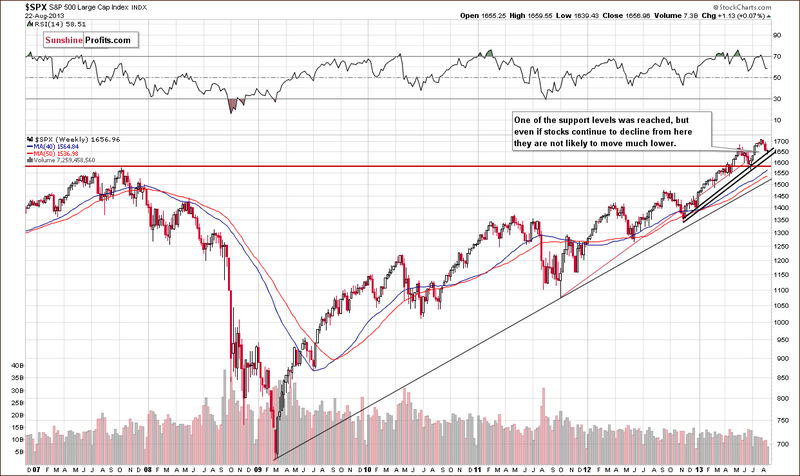 On this week‘s long-term S&P 500 chart we see that the situation hasn’t changed much. The correction is still shallow from the long-term perspective, and the S&P 500 Index reached the rising support line based on the November 2012 and January 2013 lows (in terms of weekly closing prices). Please note that there is another rising support line based on the November 2012 -January 2013 lows (on an intraday basis), which may stop a correction even if the current support doesn’t hold. Therefore, the downside seems limited. Do lower prices spell the end of South Africa’s gold industry?